A long, long time ago, before The House on Fremont Street was even a thought, I pinned this picture on Pinterest. I loved the entire nursery, which actually originated from the gorgeous, to-die-for blog, At Home At Home. Fast forward nearly a year. We’re in our new home, trying to add some customized elements to make our otherwise plain jane house into a home that we adore. 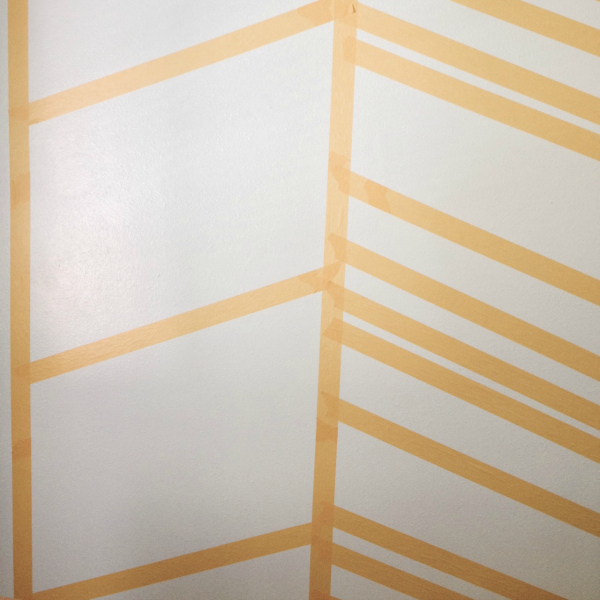 I don’t think that I would ever brave painting a true chevron pattern on the wall, as trying to make all of those zigs and zags align perfectly (they’d have to. HAVE TO.) makes me want to cry, but this imperfect version of a herringbone pattern seemed doable. Even for this paint-hating DIYer. I promise to include a full step-by-step guide in the next post, but we’re only halfway through and I hit a bump in the road along the way, so let’s talk about that first, shall we? 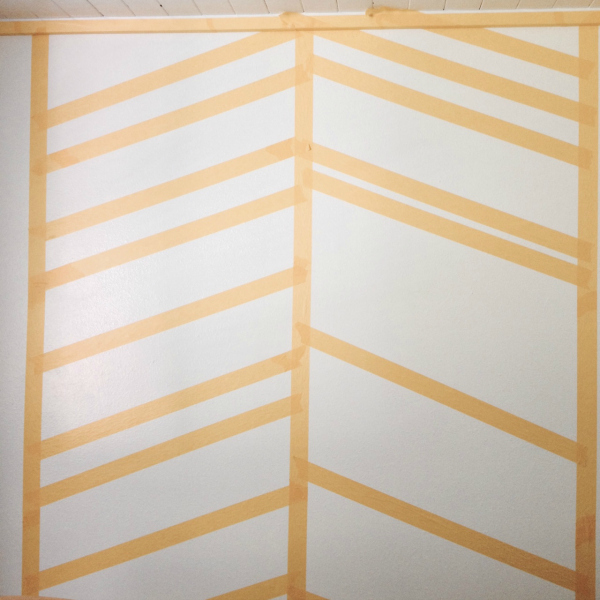 We used FrogTape Delicate Surface (since we had just painted the wall with a fresh coat of white paint), which is pretty much the best thing ever. It’s so soft and easy to put on the wall. 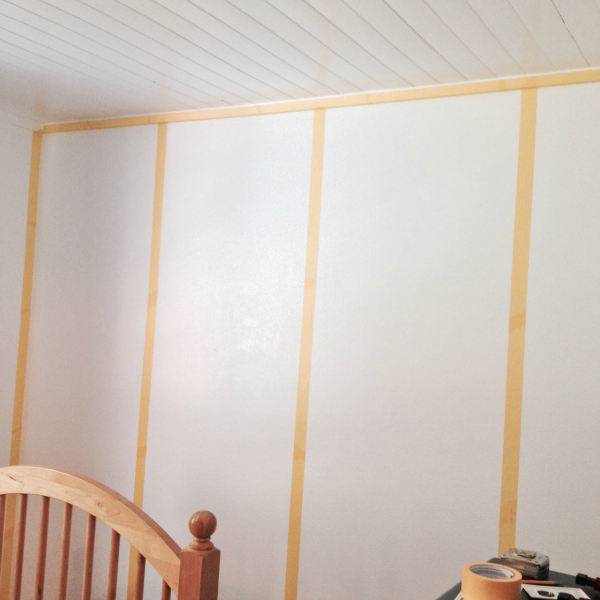 Note that we used the wider tape, giving us almost 2-inches of coverage for every white line. Josh was in charge of the first step: getting the vertical lines perfectly spaced and perfectly straight. He’s good at things like that. I’m not. This is why we’ve been married for nearly 12 years. Now my work began. 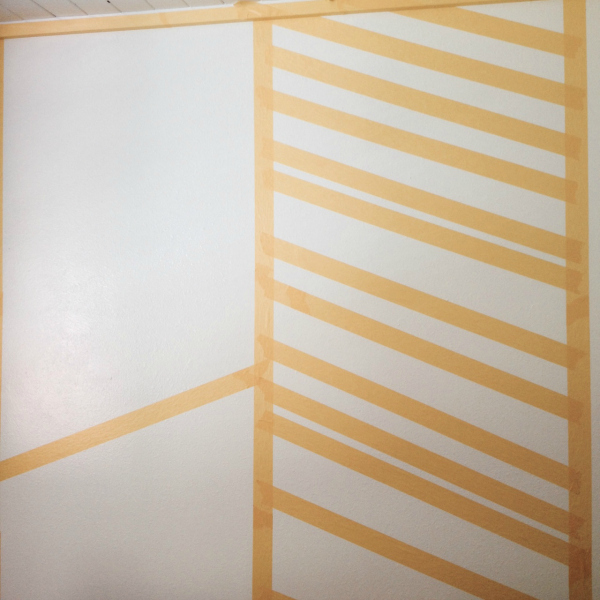 I started in the center of the wall, taping off two of the first herringbone lines about mid-way up the wall. I didn’t want them to perfectly connect, but I did want their angles to be similar, which I just eye-balled. Then, I started tape off of my first piece in one section. I didn’t want each section, which will be painted blue, to be the same size, so I just taped my heart out, adding new lines until I had filled up the entire section. This was the result. When I stood back, I wasn’t as excited as I should be. When I compared it to my inspiration picture, I realized that I had added far too many lines. 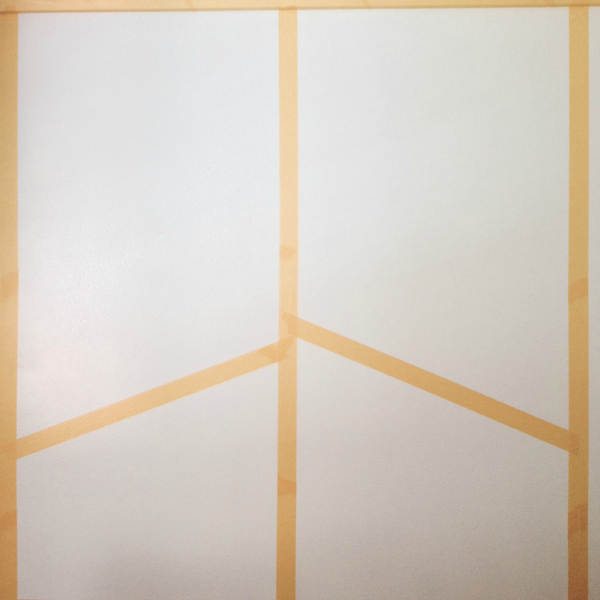 Instead of starting over, I went with a new strategy for the adjacent section, starting with taping three pieces: one that was in the middle, then one above and one below, giving me three equal-ish sections. Once those looked good (it was tricky to get their angles right! 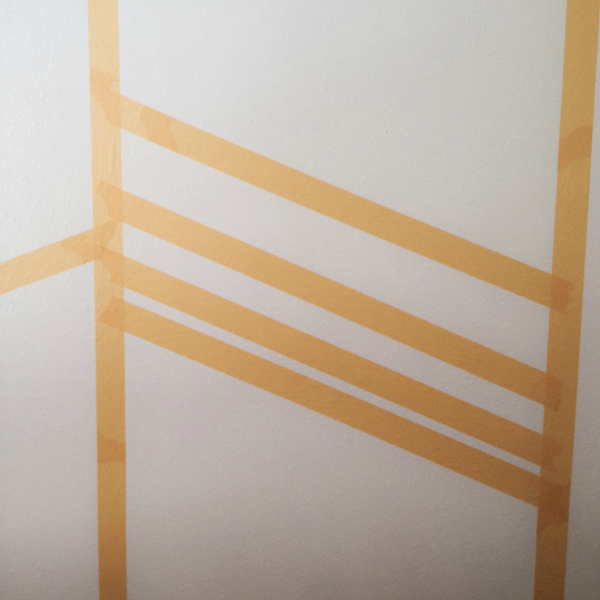 ), I added two lines of tape below and above each of the three main tape lines. Once that side was taped, I went back to the first section and removed about half of the tape that I had applied originally. I just did some random picking and choosing, being careful to step back away from the wall, to check on the progress as I removed each line. In the end, I love that the section on the left is a little more structured, while the section on the right has some skinnier and thicker bands. I think they’re a good balance for each other… at least until we get started on the outer sections! We’re going to finish taping tonight and maybe I can convince Josh to start painting for me too… Stay tuned for a full reveal and step-by-step instructions (minus the ones we wasted time on!) next week! This entry was posted in Everett's Room, The House on Fremont Street and tagged 2014, DIY Projects, Everett's Room, The House on Fremont Street on April 30, 2014 by Katie Kavulla.